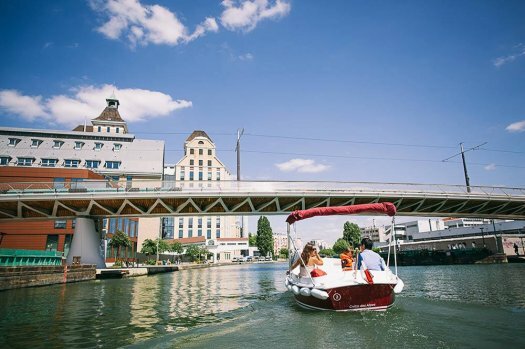 Small license-free electric boats are available at Bassin de la Villette to allow you to sail leisurely on Canal de l’Ourcq, Bassin de la Villette, Canal Saint-Martin, Pont de Crimée. The sailing boat amateur will be delighted to enjoy this experience - no licence, noise or pollution, boats can be rented with 5 or 11 seats for a pleasant trip on the canals in the North East of Paris. A very nice idea for a cruise in summer days where you can be the pilot! 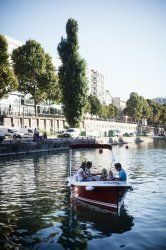 It's even possible to rent a boat with a table, an original way to lunch while comfortably visiting Nothern-East Paris. You love water activities in Paris? Don't miss our page about things to do near canals and rivers. Several packages are available. You have the choice between 3 types of boats: 5, 7 or 11 seats (there is nothing to prevent you from taking a trip with your loved one on a 5-seater boat) with the option of a cruise for one hour, two, three, half a day or a whole day..
Whatever your boat option, it will be easy to manoeuver, silent and odourless. You can then leave to discover 40 km on water between the different canals near Paris and sailing a little further on Canal de l'Ourcq ! The company Marin d'Eau Douce offers itineraries in accordance with the duration you opt for in order to optimize your boat trip. In order to accompany boat trip users and to ensure their safety, the company Marin d'Eau Douce who rents these boats imposes before each departure, a functional safety briefing, operating procedures (mooring, passage of locks...), navigation rules and safety equipment measures. Rates per hour and promotional offers are available for half a day or full day rentals. The prices mentioned below are approximate. Hire for 1 hour, 2 hours, 3 hours... a day – take a look at the rates of boat rental with the company Marin d'eau Douce. You can also rent for a small group. Where to book a license-free boat in Paris? on the banks at the level of Bassin de la Villette – near the cinema house MK2 and more easily accessible by metro.